Whether we feel them or not, earthquakes are a common occurrence on and around Vancouver Island. For the most part, they cause no concern and go relatively unnoticed. However, seismologists warn that a larger earthquake is inevitable, and it’s for that reason it’s important that we’re each prepared. Every October British Columbians in every corner of our Province practice the “Drop, Cover and Hold On” method during The Great British Columbia ShakeOut. Knowing what to do in such a situation before it happens is the best way to protect yourself and recover from an actual earthquake once one actually occurs. 1. Drop to the ground, take Cover under a table or desk, and Hold On to it as if a major earthquake were happening. A good rule of thumb is to wait 60 seconds, as that’s generally how long an actual earthquake would last. 2. Before emerging from under the table or desk, look around. If an actual earthquake occurred, what kind of damage do you think would be sustained? Others around you may need help, but first make sure it’s safe to venture out from under your sheltered area. 3. What happens after an earthquake? That depends on whether you’re in a car, at home or at work. Click each of the highlighted links to learn more. 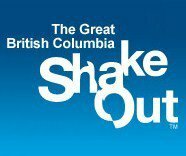 If you’d like to learn more about earthquake safety and preparedness, The Great British Columbia ShakeOut or how and where to participate in your community, visit the ShakeOut website. Because Vancouver Island’s located on a hot seismic area, many local schools communities will be participating, so make a point of doing so.